Fan Bingbing (范冰冰 ) is the most influential celebrity in the Greater China region, according to the 10th Forbes China Celebrity 100 list which was released today. Earning 110 million RMB last year, Fan Bingbing climbed to the top spot for the first time. Jay Chou (周杰倫) is in second place with 104.2 million RMB in earnings, while Andy Lau (劉德華) is in third place with 47 million RMB. The annual Forbes China Celebrity 100 list ranks the most influential entertainment and sports celebrities from mainland China, Hong Kong, and Taiwan. Since Forbes factors in earnings as well as exposure rate from sampled print and digital media, the highest earner is not automatically the most influential celebrity. The top earning artist is actually Donnie Yen (甄子丹) with 115 million RMB. In 2004, Fan Bingbing blazed onto the Forbes ranking in the 27th spot. Last year, she was in third place behind Jay Chou and Andy Lau. Since 2007’s Lost in Beijing <苹果>, Bingbing’s films have been regularly featured at international film festivals, making her a popular figure among the international press and luxury brands. Bingbing’s Double Xposure <二次曝光> earned 100 million RMB at the mainland Chinese box office last year, proving the powerful style icon’s draw. Jay Chou was in the top spot in the 2012 Forbes China Celebrity 100 list, but he had relatively low output this year aside from the release of his Opus 12 <十二新作> album and working on his self-directed musical film, The Rooftop <天台>. Becoming a father last year, Andy Lau has noticeably slowed down his work schedule to prioritize his family. Despite earning only 47 million RMB, Andy makes regular appearances at international film festivals, boosting his exposure rate. Huang Xiaoming (黄晓明) has grown from a television idol to film lead, starring in a wider genre of projects. Moving from 23rd place last year, Xiaoming climbed to the 8th spot this year, earning 75.9 million RMB. Sun Li’s (孫儷) rank ascended the quickest this year. Due to the popularity of mainland drama, The Legend of Zhen Huan <后宫甄嬛传>, Sun Li climbed from last year’s 96th position to this year’s 22nd place with earnings of 30.6 million RMB. The opportunities for television artists have increased rapidly, boosting the earning power of idol actors. Yang Mi (楊冪) earned 43.7 million RMB in 7th place, Nicky Wu (吳奇隆) earned 36.4 million RMB at 37th place, and Hawick Lau (劉愷威) earned 29.9 million RMB in 49th place. The growing music industry in mainland has made it a critical market for Taiwanese and Hong Kong singers in recent years. Taiwanese singers such as Jolin Tsai (蔡依林), Leehom Wang (王力宏), May Day ( 五月天), and Elva Hsiao (蕭亞軒) dominated the list due to their significant earnings from concert ticket sales in mainland China. Among the TVB artists on the Forbes’ list, Kevin Cheng (鄭嘉穎) is ranked the highest in 48th place. Raymond Lam (林峯) is in the 72nd spot. Myolie Wu (胡杏兒) is the highest ranked Hong Kong female celebrity in 82nd place, surpassing even Carina Lau (劉嘉玲) in the 88th position! I wonder how accurate this list is? It is a bit shocking that Fan Bing bing earns more than Andy and Jackie?? If “Switch” had released in the mainland box office last year, Andy Lau may have been the top earner. However, the film was delayed in its release due to failing to pass censorship guidelines. Fan Bingbing earned her income mainly from brand endorsements. She is regularly featured in women’s fashion/lifestyle magazines and invited to prestigious red carpet and fashion shows. With designers hoping to go after the luxury female goods market in mainland, Fan Bingbing is the perfect choice. I’m surprised that with Andy Lau’s relatively low earnings last year, he was still in the 3rd spot. The mainland media must love him. Donnie Yen should have been placed higher given his chart-topping earnings. Thanks for the info! I had a feeling that something was not right about this list. Endorsements really are a good way to make money and are one of the easiest ways to make money. Donnie Yen’s earnings topped them all last year. With more films released in 2013, this may be even a more rewarding year for him. Due to Myolie, Kevin, and Raymond’s growing influence in China, their positions should also increase next year. Also predict more TVB artists to make the list next year, such as Bosco Wong and possibly Ron Ng. I was surprised by Zhou Xun, Tang Wei, and Li Bingbing’s positions given their level of international fame. Bosco maybe but I kinda doubt for Ron. Bosco has a lot of products next year. ron has two mainland series this year and grand production triumph2 pairing with myolie and another promising sdu series with ruco. if he sign with tvb he might film another series in august but if not he might film another mainland series. stop putting ron down. agree his fee already reached 150k per episode for the series with tiffany tang. heard tavia before only received 40k for her series with ady an. 150k for Ron but 200-250k for Bosco. Ron is filming 2 series in China but if those two are not aired this year, it wont be counted in his income. Txb series only can give him at max 75k. Even if Ron’s two Chinese ones are aired this year, with 150k, for 50 eps, he has total 750k. 750+75=825k, hasnt reached to 1 mil yet. While Bosco has 75k for Txb series, 750k for Detective Dee, already 825k, and he has 2 other movies on hand to add in the income at least 300k. So I still doubt for Ron in Forbes this year. Even Bosco, may not. Oh add one more zero to any total things. Not 1 mil but 10 mil. 8250k aka 8mil250, not 825k. It’s kind of scary to think Jay Chou, Jackie Chan and Eason Chan are among the top 10 most influential celebrity. Artist management co has to submit their earnings to Forbes China in order to be placed in the list. Previously, Chen Kun has already said he does not wish to appear in such list and has his income being disclosed. Now he is having his own management co, thus I don’t think he will submit his earning to Forbes. Artist management co has to submit their earnings to Forbes China in order to be placed in the list. Previously, Chen Kun has already said he does not wish to appear in such list and has his income being disclosed. Now he is having his own management co, thus I don’t think he will personally submit to Forbes. Besides that, he did not film any movie last year and Bends was only filmed to help out new Director. His earnings for last year are mostly endorsements and mag covers. (He has a lot of endorsements and mag photo cover last year). Chen Kun once said he is a lazy guy so he does less things than others, only the things he enjoys he will take part in. He dun really care for money. It is care to work and do things that you want and when you want, not just for money. That’s why it is desperate to be his fan. He just don’t care. Nowadays he don’t even want to attend functions. Fans can only buy books as this is the only thing he does now. I think he has becomes an authour and publisher instead of an actor. i’m confuse cuz from what i read somewhere, the above list should be for “the most influential celebrity”. but the “top earner list” it different, it should be like: 1)Donnie Yen 2)Fan BingBing 3)Jay Chou 4)Jolin Tsai 5)May Day…………. so it means the most influential doesn’t necessarily make that person the top earner. i really want tavia yeung to venture into the mainland market instead of filming for tvb! i believe it’s because of her Him. Afterall, if she leaves, it might affect his career. Tavia is still needed at TVB to anchor series this year. Aside from “The Hippocratic Crush 2”, she will be filming a new series with Steven Ma in August. She may have the last quarter of the year to film in mainland. Since she won TV Queen last year, I’m sure TVB will give her the chance to earn more money in mainland for the company. Because of the demands of the Chinese investors. If there isnt invitation or invitation with too low payment, they cant go or their PR team wont let them go. Being a winner in Txb award doesnt mean the Chinese investors want to have her/him. The investors look for other factors, too. For example: fanbase, popularity, language (minor factor), price, star power, role and acting. Agree with you!!! that why KEVIN, MYOLIE, SHEREN, ADA and even other TVB artist taht I dont know is in mainland. That is because they have more market and even in china have more chinese investors that invest in them. heard that tavia’s fee is low. besides tvb won’t allow their siu sangs and fadans to take supporting roles, mentioned by steven ma. only lead roles with high fees are accepted by tvb. Not really. Most of Txb artists played/play supportings in Chinese series. Example: Myolie in Scheme Beauty, Fala in Da Mo Yao, Ron in Great Maid, etc. Txb accepted supporting roles with not high fees, too. Its up to the chance. But first has to have MARKET IN MAINLAND. If they dont have market in china no body will hired or contact them to be even as a support actress or actor. the last time tavia filmed in mainland, her fee was low at 40k per episode and she was a supporting actress to ady an. maybe tvb don’t want that to happen again. when she receives a lead role with high price, tvb might let her go. Or the artists with the best PR management to increase their artists’ exposure rate. They are influential in swaying consumer interest in primarily commercial means. You need to see the China version in order to catch a glimpse of her. Her scenes was all cut off in the international version. congrats to myolie and kevin! proven that they are very powerful artistes and among top most powerful from tvb. LOL. Funny how you ignored Raymond. myolie might make it again next year. she will film another mainland series after rosy3 which make it two mainland series for her this year. add on exposure and popularity from grand productions triumph2 and rosy3 which might make her a frontrunner for tv queen awards and means more popularity and influence,, and she has a few mainland series waiting to air to secure her spot in mainland. don’t forget the countless endorsements. SEL_FI_WU Agree with you!! You are thinking like me!!…. hahahahah I am very happy just looking the news or performance that she has in mainland like participating in mainland populars TV SHOWS and commercials even in mainland DRAMA that she is filming and soon airing. Nick is 32. I’m surprised Michelle isn’t up there. I think s/he means Nick Cheung, not Nic Tse. is the news wrong ? I think they mean the only TVB female artist that make it into the list. Noooo.. they are saying Hong Kong Female Celebrity but not all hong kong. they are just saying part like just in TVB female artist. Like in TVB male artist the top is KEVIN CHENG, then RAYMOND LAM and in female is MYOLIE WU. Fan bingbing resemble like the young version of Rosmund Kwan above pic. No Michelle Ye? I thought she’s pretty successful in mainland? Wow, Hawick Lau ex TVB dude actually made the list? haha wow. happy that Raymond lam is on the list…although he is at the lower part of the list…but add oil…wish you a bright future! What about Charmaine Sheh? I thought she had done really well last year??? I remembered read an article that she received a large sum of money for a series that she filmed in mainland. I think it called “Marry into the Purple”? I think it is crucial for us to be mindful that this list is not at all inclusive as many celebs are off the list because of their choice to be low-profile about their earnings. I am not surprised by the number of TVB’ers on the list as the TVB propaganda machination loves to eat this stuff up. It also helps them to refute the popular accusation that they don’t pay their people enough. Maybe in part speculation. Actors have their own market value so to speak and their revenues are often speculated. Private market values are important in fee negotiation but I am not sure how them come in to play in a report of the prior-year actual earnings. Forbes is a very reputable publication so the presumption of earnings accuracy must at least be tendered initially. However, I highly doubt the numbers published are audited or that Forbes had access to the tax returns of these people in order to authenticate the revenue data. In conclusion to this news. 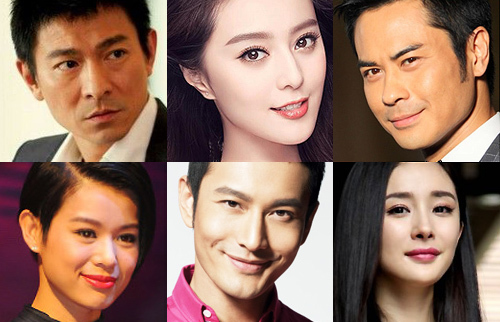 I am very happy that my idol MYOLIE, KEVIn, RAYMOND, CHARLENE and GILLIAN is in the 2013 FORBES CHINA CELEBRITY 100 LIST. If I remember last year 2012 my dearest MYOLIE and KEVIN is in the list tooo…. CONGRATULATION to them, THEY ARE THE BEST IN TVB THEY CAN DO MORE AND MORE PERFORMANCE, SONGS, SHOWS, MOVIE AND DRAMA. SUPPORT 4EVER THEM AND ALL THAT I MENTIONED. ADD OIL !! MYOLIE AND KEVIN AND RAYMOND TOO THEY ARE THE NEW GOLDEN COUPLE IN TVB AND EVEN IN MAINLAND DRAMA. LOVE THEM!! !